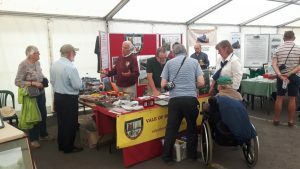 VBR attended the GWSR Steam Gala this bank holiday weekend, selling second hand model railway items, raffle tickets, membership and promoting newly launched funding schemes. It was also an opportunity to use our new display board which Paul & Graham erected on Friday evening, using the new posters that Howard put together during the week. This helped to make the stand look very professional. 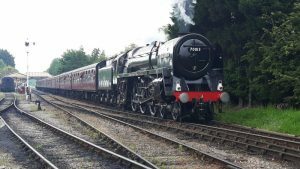 The gala was a fantastic event with 8 locos in steam using an intensive timetable along with a host of other attractions, in particular at Toddington where we were based. 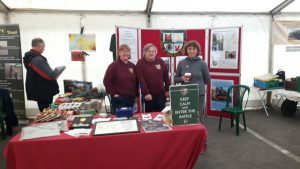 It was very well attended with just under 6000 visitors, so we had lots of opportunity to talk to people who all wanted to know more about our project. In the end we sold £212.50 worth of stock and made a further £97 from the raffle tickets. Hats off to Noel who clearly had a real knack for selling these. We also gained a further 4 members, and took a membership for the 100 club and the new Covenanters club. Many thanks & well done to all that helped on the stand.